Havasuw `Baaja, the people of the blue green waters, are the traditional guardians of the Grand Canyon. Related to the Yuman, the Havasupai have from the beginning, inhabited the Grand Canyon and its environs. By 1919 with the establishment of the Grand Canyon National Park, the Tribe was restricted to 518 acres, 5 miles wide and 12 miles long in a side canyon. The Tribe has since had returned to them 188,077 acres of their former homelands which makes up their reservation today. The Havasupai Reservation is located in Coconino County, at the southwest corner of the Grand Canyon National Park. The nearest community to the Reservation is Peach Springs, 64 miles southwest from Hualapai Hilltop. The Havasupai Reservation consists of plateau country, dissected with deep, scenic canyons characteristic of the Grand Canyon of the Colorado River. Notable geographic features include “The Great Thumb,” Long Mesa, and Tenderfoot Mesa, which converge on the Coconino Plateau at the south end of the reservation. Havasu (Cataract) Canyon, now the permanent home of the Havasupai Indian Tribe, is internationally known for its blue water and spectacular water falls adorned with travertine columns, shelves and skirts. Topography of the plateau areas varies from rolling, gentle slopes, to escarpments of outcrops of the Kaibab Limestone. The population for the Havasupai Tribe is 639 with a median age of 24.8 years. The largest employer of the tribal members on the reservation is the Tribe. The main occupation of individual members is packing and working for tribal enterprises (tourism). The Havasuw `Baaja, draw their strength from the land, which is sacred. Visitors are asked to preserve the magnificence of the Havasupai homeland and respect their natural resources which contribute to their spiritual direction. All visitors are asked to leave their liquor, drugs, weapons and pets at home and to take their trash out of the canyon. The best way to reach Havasupai is from Highway 66, six miles east of Peach Springs, onto Indian Route 18, a 64 mile road to Hualapai Hilltop. From the Hilltop parking lot there is an eight mile trail to Supai Village. This trail may be traveled either by foot or horse. There are four waterfalls (Navajo, Havasu, Mooney, Beaver) from 1.8 miles to 5 miles from the village. Their turquoise blue waters offer swimmers a refreshing and relaxing experience. In Supai, there is a cafe, post office (mail is still delivered by mule train) and a store. A campground site is available near the gorgeous waterfalls two miles north of Supai village. Camping else-where is prohibited. Havasupai Lodge offers first-class accommodations in its 24-unit lodge. 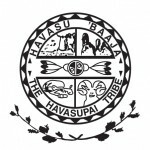 The Havasupai Tribal Museum offers tribal crafts and displays photographs.